An antique magnifying glass is more then a functional tool that makes objects appear larger. 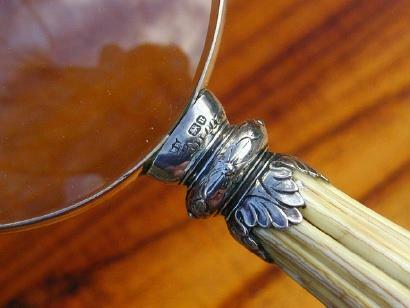 From the elaborate Victorian repousse designs to the sleek lines of the Art Deco era, each magnifying glass is also a treasure from years past that needs to be cared for and preserved. Reading stones, the early predecessors of magnifying glasses were used by farsighted monks as early as the eleventh century. Made from polished and shaped rock crystal, beryl or glass, reading stones were placed flat onto the text which was then magnified by the stone's shape. This same concept is still used today when we use a full page or a flat sided, one line magnifier that is laid flat onto the page. Throughout the following centuries as Venetian glass blowers refined their glass making techniques, they also developed frames for their glass magnifying lenses. From these early beginnings came microscopes, telescopes and eyeglasses. Magnifying glasses that were part of a one-piece set were very popular in the early 1900s. Many of the combination sets of the time held a small pencil in a tiny compartment. An exquisite example of a combination magnifying glass, map measure and pencil, made in 1911 by The Goldsmiths and Silversmiths Co. of London, belonged to Lieutenant Colonel Sir Henry L. Galway, former Governor of South Australia. The engraving on the piece is dated 1913. Another example of a combination set from the same time period consists of a paper knife, magnifying glass and pencil. This piece was made by J. Vickery of Lonon in 1912. Popular in the Victorian era, this beautiful silver bookmark, magnifying glass and pencil combination was made in 1897 by James Bell and Louis Wilmott of London. Gentlemen of the early 1900s often carried a Pocket Necessarie, which is a small kit that contained all of the necessary items a proper gentleman might need. A fine example from Sampson Mordan and Company of London, this 1937 Gentleman's 9ct gold and enamel Pocket Necessaire includes a magnifying glass, watch, penknife, perpetual calendar, door key and pencil. When closed the overall measurement is a tiny three inches. Small magnifying glasses often were worn by women as a pendant, brooch or on a chatelaine. This type of jewelry was very common in the 1800s, as most women of the time did not like to wear their glasses out in public. An example of these beautiful magnifying glasses includes a Pierre-Bex Art Deco magnifying glass necklace made from gold plated copper, trimmed with rhinestones. An antique magnifying glass collection should be displayed for everyone to enjoy. There are special display cases and tables that will hold these treasures proudly. They also look wonderful mounted in display cases and hung on a wall.